Portable computing technology in the form of Smartphone’s, tablets and laptops, innovations is the order of the day. This is constantly used to make the technology smaller, faster and more efficient. The mobile application development training in Indore will help you grab the basics of application development and also give you a hands-on exposure in the field of Android and iOS application development. 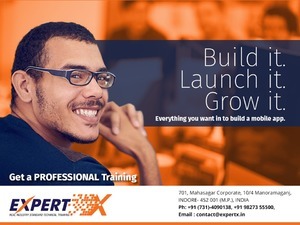 Android Training in Indore with ExpertX is directed towards corporate, individuals, tech enthusiasts and students. It is a comprehensive hands-on training with an intensive syllabus and thorough approach in Android application design and development. Expertx training course will empower you with the knowledge of visualizing, building, programming and publishing an Android application. The mobile application development training is mainly focused on developing the programming skills that enable a person to develop his/her own application. The course also gives enough weight age in developing the knowledge of various platforms for application development. With this training, it is possible for a person to develop applications for various problems that are handy as well as aesthetically beautiful. •Android training in Indore is designed according to current IT market. •Offer the best Android training and placement with well defined training modules and course sessions. •Facilitate regular, weekend and customized Android training. •One of the biggest team of certified expert trainers with 5 to 110 years of real industry experience. •Mentors of Android training helps in major project training, minor project training, live project preparation, interview preparation and job placement support. •Smart labs with real latest equipments. •Real Industry Oriented Live Projects under Experts.